Window Pet™ Decals are personalized see-through decals for your vehicle windows or any window of your choice so you can show off your pet! Material used to create your personalized window cling is a high quality polymeric calendar vinyl protected by clear over laminate. Use Window Pet™ for any of your furry friends! Step 1: Buy your Personalized Window Pet below. After purchase you will return to this page. Step 2: Fill out below form. Step 3: E-mail your photo to Delectable Doghouse. Picture should be on a background that does not blend in with your pet. Head measurement: Approximate inches from top of head OR ears (whatever is highest) down to the bottom of chin. Q. Does my Window Pet go on the outside or the inside of my window? A. Window Pet is manufactured to apply to the outside of the window. Q. How easy is it to put the decal on my window? A. It is very easy and there is an instruction sheet will be included with your window pet order. Q. 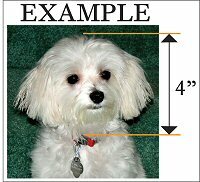 Why do I need to measure my pet’s head? A. Window Pet is intended to be as life-size, we strive to represent your pet’s true likeness. Q. Can I roll down my window? A. We recommend you put your Window Pet on a window that is stationary to keep edges from getting frayed. Q. Can I take my vehicle through a car wash? A. We recommend hand washing or secondly, automated soft touch carwashes only. Q. Can I put the decal on a dark tinted window? A. Yes, just keep in mind the hair/skin color of your pet vs. the darkness of the window. Q. Can I make my large pet into a small Window Pet? A. Certainly, but we do not recommend it. Q. What resolution does the photo have to be? A. The better the resolution/quality is the better the Window Pet will be. Most digital cameras and phones manufactured after 2005 will work well. We suggest taking several shots and choosing the best one for submission. Q. Can I do a collage of my pets? A. Yes, but we need measurements of all pets heads.